View More In Carving Knives & Forks - Page 5. 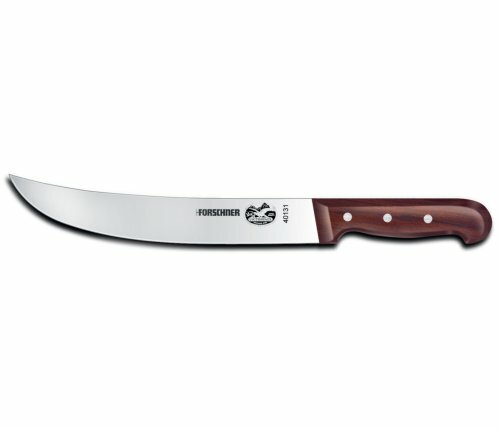 The R H Forschner by Victorinox Cimeter Knife features high carbon, stainless steel blade, hand finished at Victorinox in Switzerland by skilled craftsmen. A special tempering process is used to produce an edge that can be resharpened over and over again, so the knife can keep its original sharpness throughout the entire life of the blade. Victorinox handles are ergonomically designed to minimize wrist tension. They provide a natural fit. A good heft and comfortable, positive grip are indications of a well-made knife. Although cutlery steel is naturally sanitary, materials and construction details of the handle minimize crevices what would offer hospitality to bacteria.